1. An anti ragging committee comprising the Principal, HODs, Wardens and Student Representatives has been constituted. 2. An Anti Ragging Squad was also constituted with the members on vigil throughout the day from well before the college started upto late in the evening. In the first three months surprise visits by the members took place to check any untoward incidents. 3. Notices explaining the anti ragging measures were displayed on all the notice boards in all the departments of the college as well as hostels. Postures discouraging ragging have also been displayed at all strategic points. 4. Notifications have been released clearly mentioning that ragging is banned in the college. 5. The Prospectus contained information about the directives of the AICTE about the prohibition and consequences of ragging. 6. On admission every student was given printed information about to whom he has to turn for guidance for various purposes including warden, HODs and members of anti ragging committees along with their phone numbers. 7. 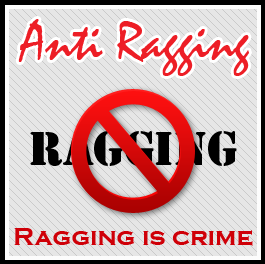 Undertakings by students have been taken saying that they are aware of the laws of ragging. 8. As part of the orientation a counselling session was organized for the fresher's and their parents. In his address the Principal explained to them the measures of anti ragging taken by VIT as per the recommendations of the JNTU and AICTE. 9. A gap of two months was maintained between the class work of the fresher's and the seniors. 10. The class work timings of the seniors and the juniors have been staggered so that the fresher's and the seniors did not meet. The Principal, HODs and senior faculty addressed the seniors explaining to them the menace of ragging and the severity of the situation, the directives of the Supreme Court, the AICTE and JNTU and punishment that will be meted to them in case found to be guilty of ragging. They also informed them that the burden of proof lies with the accused and not with the victim.